US political journalist Tim Russert, Jr. collapsed on Friday at work, according to NBC sources. He was 58. Russert, best known to Australian viewers as host of NBC’s weekly Meet the Press, served more than 16 years as moderator for the program. Seven still screens the show at 4am on Monday mornings. He was the longest-serving presenter on the world’s longest-running show. Russert was recording voiceovers for the Sunday edition of Meet the Press when he collapsed this morning at the offices of WRC-TV. Immediate attempts at resuscitation by EMS were unsuccessful and Russert was pronounced dead following transportation to Sibley Memorial Hospital. News of his death was reported live on NBC, CNBC, and MSNBC by Tom Brokaw. An autopsy determined that his history of diabetes mellitus and coronary artery disease lead to sudden cardiac death. 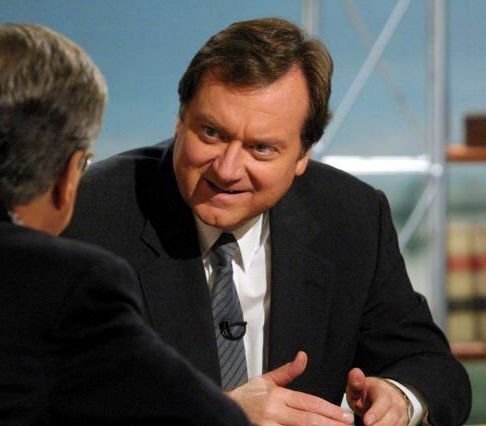 The entire half hour of the June 13 NBC Nightly News was dedicated to Russert’s memory, featuring previous news segments with Russert and interviews with colleagues. Known for phrases like “let’s watch” and “let’s listen” Russert was recognised for his ability to research and pull audio and video quotes from quests that were inconsistent with current statements, creating a dynamic tension that provided interesting and enlightening interviews. He was also a highly respected commentator on US election nights, using a marker board which has since been acquired by the Smithsonian’s American History collection. During his career, Russert received 48 honorary doctorates and won several awards for excellence in journalism. Guiding Light started on radio and moved to TV in 1952. Meet the Press started in 1947. How sad. But can “Meet the Press” really be the world’s longest running show when the daytime soap “Guiding Light” has been running continuously for an astonishing 71 years? Now that, that’s a REAL shock. What a loss. Russert made it well worth being a late-night TV viewer – he was one of the most incisive, well-researched and passionate political interviewers I’ve ever seen. He was the longest serving host of the world’s longest running show. He wasn’t the world’s longest running host. as much as this news saddens me, being an insomniac and therefore a russert fan, surely Daryl Sommers is the was the longest-serving presenter on the world’s longest-running (non animation) show. Holy crap! Thats crazy news, he will be a hard man to replace. Geez this is a shock. I watch NBC Today all the time and Tim’s contribution to all things political is second to none. So sad as he was really enjoying the lead up to the presidential election.